Description: SoundXY4 is an ambisonics system for music performance with a tangible interface. 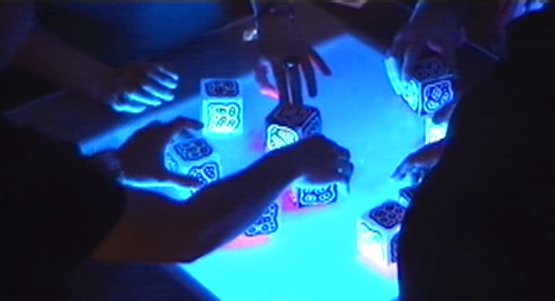 The system includes 6 white cubes, which each represents one of the 6 sound categories in Russolo’s “Art of Noise”. There are also black cubes, which represent filters that can modify the sound of the nearest white cube. The angle of the white cube on the table surface defines the position of the sound source in the room using ambisonics. SuperCollider is used for the visual feedback as well as for the audio engine and program logic. Xambó, A., Roma, G., Laney, R., Dobbyn, C. and Jordà, S. (2014). SoundXY4: supporting tabletop collaboration and awareness with ambisonics spatialisation. In Proceedings of the International Conference on New Interfaces for Musical Expression 2014 (NIME ‘14). London. pp. 249–252.